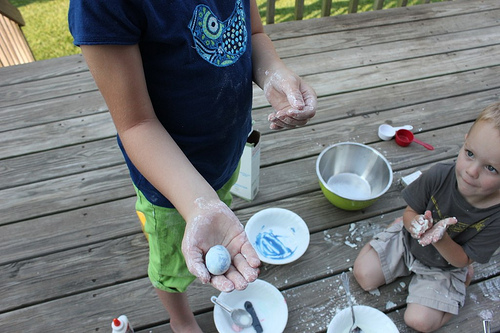 We had fun making homemade bouncy balls today, even if it did result in one giant mess! 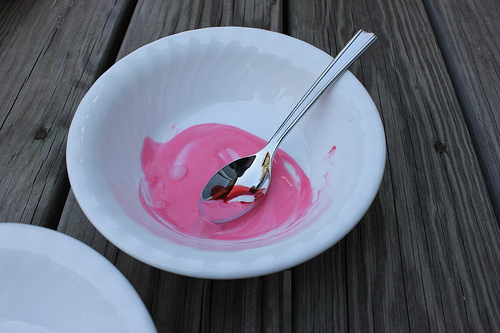 Mix the glue and a few drops of food coloring of your choice together in a small bowl. 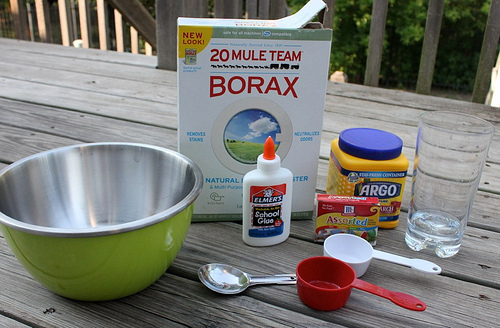 In a separate bowl, mix the cornstarch, borax, and warm water together. 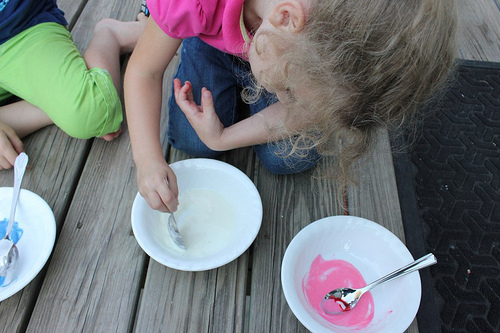 Pour the cornstarch mixture over the glue and combine together. Stir until a glob forms. Take the slimy glob out of the bowl and roll it in your hands. It will be very sticky at first. 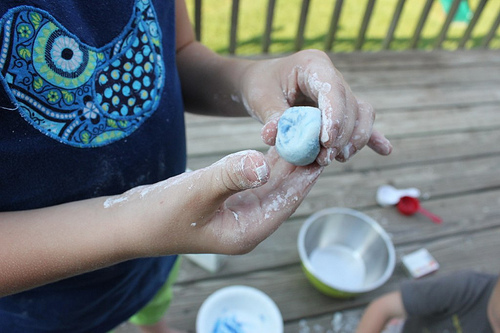 Continue rolling for at least a few minutes until it is no longer slimy and feels more like a soft rubber ball (you may need to put some cornstarch on your hands while rolling to help all of the stickiness disappear). 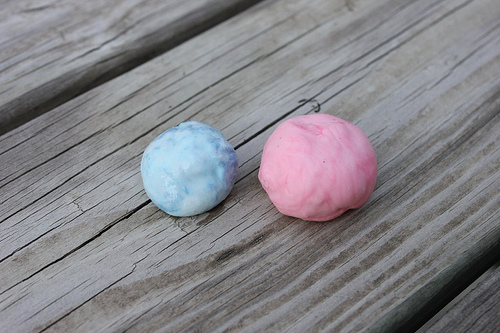 Have fun bouncing your homemade bouncy ball! 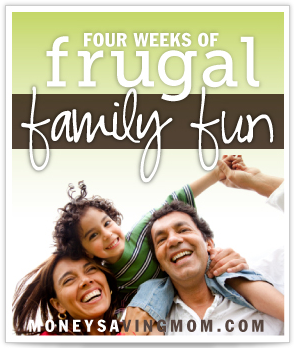 Today was very frugal! We went to the $1 movie at Regal this morning, using our free popcorn coupon. Then we went to Teriyaki for lunch and my punch card was full so the meal was free! (my son and I share one order, large portions!) Then we went and rode bikes and finished up with a free Redbox game rental! Yup, spent $2!! Great job! 🙂 I forget about punch cards sometimes. Kathrynne looks so grown up!! 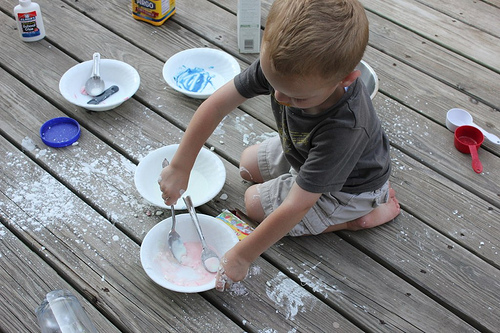 Looks like you had lots of messy fun! Did the balls bounce? We had our first field trip! We went to the firestation where my nephew works, and he gave usa tour of the truck and the engine. The children got to climb on the firetruck and had lots of fun! When we came home, some friends dropped by unexpectedly, and the children played while I visited. I cut up free mirabelles (from another friend) while we talked. We made these too a few days ago. Our didn’t turn out to be too bouncy though. 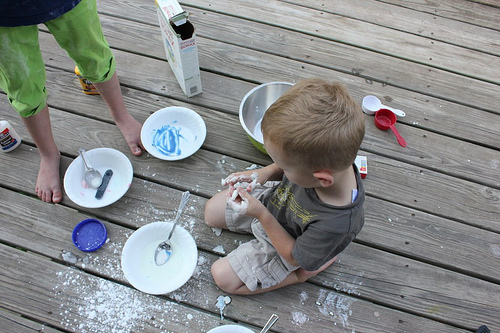 We had quite the mess when we made them but it was fun. Today we went to pick berries and got to see some chickens and a few chicks too. We had a messy one today too! We made Patriotic Popsicles out of fruit that needed to be used up before it expired. They turned out so yummy though! We had the great privilege today of gathering some children’s books to give a missionary friend who is traveling back to Africa soon. She says most of the children have never even seen a crayon! What a great need for books and teaching materials there. My family is loving all the fun we are doing this series, but they keep on asking if we are going to make a point to keep it up afterwards! thanks for such great challenges. we tried 3 times and could not get ours to bounce. What’s the trick? You have to roll them and roll them and roll them. They start to turn rubbery after awhile and the more you roll them, the more they’ll bounce. How fun ! I’ve heard about these before, but the recipes and instructions I’ve found in the past seemed so involved and difficult. You made this look super easy ! 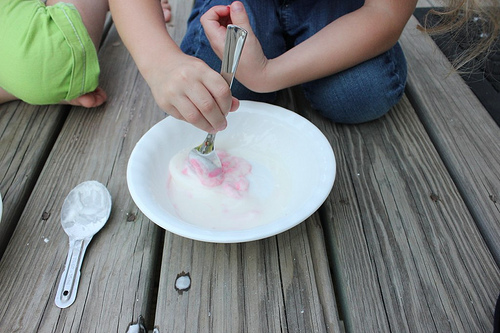 I know my boys would love this activity…definitely going on our “to-make” list ! I had a question about Silas and these kind of activities. My son will be three in September, and he really, really loves any kind of ball. I usually keep these kinds away from him because he also loves to throw them in non-appropriate places. My question is, how does he do with these kinds of activities now that he’s made it into his third year, and when he does misbehave, how do you handle it? I personally don’t believe in spanking my son. I came from a spanking home and it’s just not for me. Time out works well for us, but I just didn’t know if there was a better way to approach it. After he doesn’t listen to my instruction or does something he shouldn’t I ask him to correct it, if he refuses, I count from 3 to 1 in a slow, stern voice, and then I repeat the instruction. If he once again refuses then I sit him in time out for two minutes (We’ll switch to 3 when he turns 3). Maybe another local experienced mom who knows you and your son might have some advice for you? As someone who works in early childhood and as a Mom in her 40s of three boys (ages 13 and 10), time outs are the best thing to use at this age. We call them “time-away” at work. Make sure the time out or time away is free from distractions like pets, toys, other family members, etc. Make it as boring as possible and make sure it’s the same spot every time at home. And don’t give in to the whining or crying in time out. Put him back if he gets out until he finishes his time. Show no anger or frustration. Be matter-of-fact. Even if you have to do it 100 times. After his time out is done, explain what the behavior was and why it’s not acceptable. Then, give him a hug and say, “I love you but no more throwing balls.” If he hurt someone make sure he apologizes to that person. As they get older (school age), taking away a favorite privilege like screen time on computer or video game for a day or two works wonders. You could also try a behavior chart, but those never worked with my boys. Age 3 can be a wonderful age, but can also be very trying. Also, although lots of projects look neat and fun to try with your child, keep in mind your child’s personality, maturity and temperament. 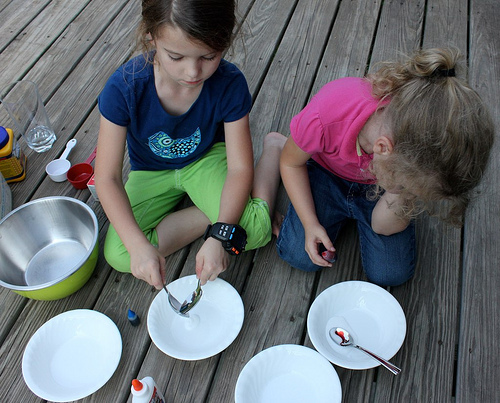 Some projects are not always suited for all kids even if they are meant for that age. As Crystal said every child is different. Know what your child’s breaking point and threshold is. HTH! Meant to add that my boys are not angels nor are they perfect, but I always do get lots of compliments out in public about how well-behaved they are compared to other kids their ages. One of my sons has Asperger’s so this is definitely something to be proud of when people tell me this. But it wasn’t always this way. When they were toddlers and preschoolers there were several times at restaurants when we had to take the child out to car for a time away with a parent because of misbehavior. But eventually they got it. The key is consistency! I don’t blog, so I can’t link up. One activity we love to do from time to time is make soft pretzels. The only ingredients are water, sugar, salt, and flour. They are easy, quick, and really tasty! Highlights magazine has a great recipe. My kids love making silly shapes, like snakes and eyes!